Hands on lab activities allow more exposure to instrumentation, equipment, and real world troubleshooting. Concept engagement and application takes place in the classroom with the guidance of an instructor. The National Science Foundation's Advanced Technological Education (ATE) program has been funding innovation at two-year colleges for over twenty years. With a focus on the education of technicians for the high-technology fields that drive our nation's economy, and strong partnerships between academic institutions and industry, ATE promotes improvement in the education of science and engineering technicians at the undergraduate and secondary school levels. To learn more about ATE, please visit the NSF ATE program home page. 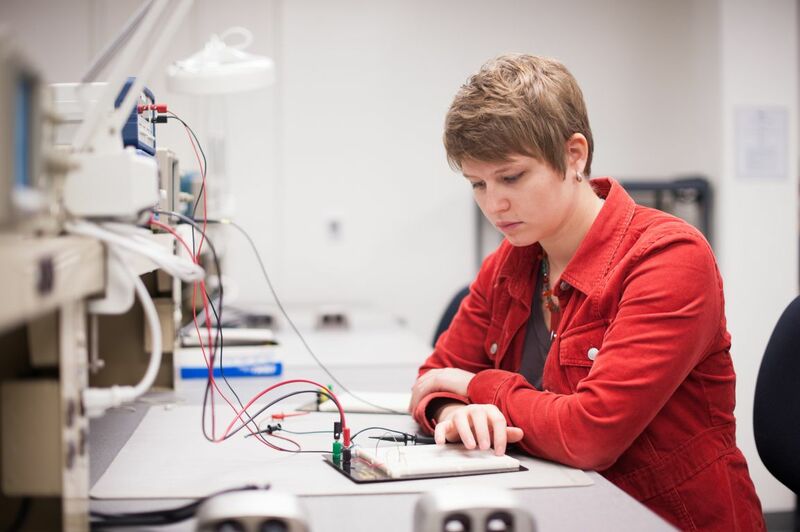 Resources developed by Columbia Gorge Community College’s electro-mechanical technology faculty support flipped-classroom instruction for teaching technical subjects like electronics, motor control, hydraulics, and pneumatics. The flipped-classroom approach delivers instruction outside the classroom and activity-based learning inside it. The approach reduces students’ textbook and commuting expenses and provides them with more flexibility for balancing college, work, and family responsibilities. Students view free online lectures at the time and place of their choosing and at their own pace. This allows students to pause, rewind, and review material as necessary. Concept engagement and application happen in the classroom with an instructor’s guidance. The Developing and Deploying Flipped Classroom Resources for Electrical Engineering, Industrial Maintenance, and Renewable Energy Technicians project is based at Columbia Gorge Community College. Columbia Gorge Community College began in 1977 as the Wasco Area Education Service District. The college is located in The Dalles, Oregon and offers academic programs in arts and humanities, career and tech education, computing science, mathematics, nursing and health occupations, science, and more. This project addresses a well-documented and growing workforce need for technicians educated in electronics, mechanics, hydraulics, and motor control in a way accessible to those already employed. The focus of this project is to develop online educational resources to support a flipped classroom approach to teaching technical subjects. The flipped classroom approach offers several advantages in that students can watch lectures at the time and place of their choosing and lecture content is always available for review. This allows a degree of flexibility for those with work and family obligations to attend a program of study. The benefits of the flipped classroom resources will be far reaching because they can be repurposed for other technical programs nationwide. The online lectures can be used to supplement or replace a textbook and cut down on student commute time and expense. The online resources allow non-traditional students with work and family obligations to maintain enrollment in a program of study. Columbia Gorge Community College (CGCC) offers a Renewable Energy Technology program that prepares students to work in the field of renewable energy technology. Technicians use electrical and electronic theory to design, build, repair, calibrate, and modify components, circuitry, controls, and machinery and are responsible for operations, maintenance, and repair of equipment at generation and transmission facilities. The content is applicable to regionally significant renewable energy generation, electrical transmission, unmanned aerial surveillance manufacturing, industrial agriculture, and general industrial maintenance, and is adaptable to other programs and regions. Previous online material developed in cooperation with the NSF ATE Center CREATE has had an immediate impact on the CGCC's Renewable Energy Technology program by allowing an evening electronics lab. Incumbent workers can take advantage of the evening labs to expand and update skills while maintaining employment. The user name or password you entered was incorrect.